NY charter school supporters are getting just a little antsy over the prospect that Mayor4Life may decide not to purchase a fourth term. It's even possible, though not highly likely, that someone not insane could become mayor, thus scuttling the drive to privatize all schools in the city. Thus, the charters are busing the parents all over the city and buying ad time to try to persuade people that charter schools are public schools. The argument that they are, in fact, public schools is central to charters’ stance that they deserve to receive space rent-free in public school buildings. That allowance is made in New York City but is rare elsewhere. Of course, it's very important that they be public. That way, no one will think folks like Geoff Canada and Eva Moskowitz are making almost a half-million bucks a year. How could they afford salaries like that if they had to pay rent, like normal private schools? Though they happily take public money, and have no problem taking neighborhood schools away from actual neighborhoods, they are not public schools. They are not managed by we, the people. To be fair, since the reign of Emperor Michael the First began, neither are public schools. We're saddled with a fake school board on which the Emperor controls eight of thirteen votes, and fires people if they even think of voting for him. Nonetheless, neighborhood schools still have input from the neighborhood. More importantly, neighborhood schools like mine take all comers, without exception. They walk in all year long, and I personally got a half-dozen students less than a month ago. My students are all ESL, and I'm not sure charters are equipped to handle them. 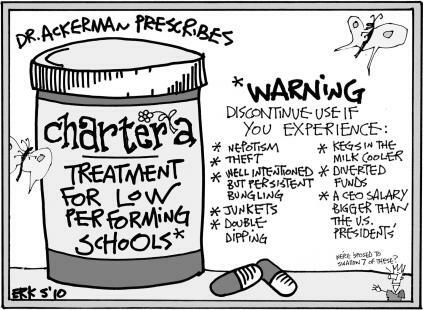 When the charters say, "We take X% special education students," you need to check a little. Special education students vary from kids who need a little extra time to take tests right up to alternate assessment--kids who will never graduate. Ask Eva Moskowitz how many alternate assessment kids she's accepted this year, last, or ever. There is a surefire way to make a good school--get good kids. By the very fact they've filled out an application, parents indicate they are involved. For my money, parental involvement is the single best predictor of student quality or lack thereof. Of course it's not perfect, and kids don't come with guarantees. However, it's sheer lunacy to solely blame teachers if kids fail tests. If it is indeed the teacher's fault, you'll find out by observing what happens in the class, rather than by from scores. Many things influence test scores, and it's patently idiotic to suggest they're a reflection of the teacher rather than the student. I teach 100% high-needs kids every day of my life and I'm very proud to do so. I cannot guarantee you they will all pass the English Regents exam. I can, however, guarantee you that I could help them a lot more if they weren't measured by such a plainly inappropriate standard. It doesn't take much for me to be presumptuous enough to say that I know what they really need. As their teacher, that's pretty much my job. It's not merely the application process that renders charters selective. We still have to account for factors like demanding parents spend hours working in them, thus excluding those who can or will not. That's before we account for kids whose parents are asked to send them to the real public schools. And that's before we account for their juking the stats by taking no responsibility whatsoever for the kids who did not make it to graduation. When they spout ridiculous 100% graduation rates, ask how many kids did not actually make it. Public schools take everyone. That's what makes them public. And a good public school embraces union, thus empowering both teachers and students.